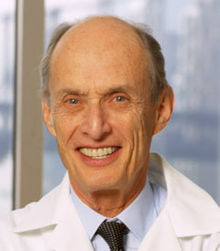 Paul Greengard (December 11, 1925 – April 13, 2019) was an American neuroscientist (neurobiologist), biochemist, and pharmacologist of Jewish descent. He was best known for his work on the molecular and cellular function of neurons. In 2000, Greengard, Arvid Carlsson and Eric Kandel were awarded the Nobel Prize for Physiology or Medicine for their discoveries concerning signal transduction in the nervous system. Greengard died on April 13, 2019 in New York City at the age of 93. ↑ "Paul Greengard profile". Rockefeller University. Retrieved 2008-09-28. ↑ "Pioneering neuroscientist and Nobel laureate Paul Greengard dies at 93". Retrieved 14 April 2019. This page was last changed on 14 April 2019, at 20:16.